We’d love your help. Let us know what’s wrong with this preview of USA Southwest (Las Vegas, Colorado, New Mexico, Arizona, Utah) Marco Polo Guide by Marco Polo. To ask other readers questions about USA Southwest (Las Vegas, Colorado, New Mexico, Arizona, Utah) Marco Polo Guide, please sign up. 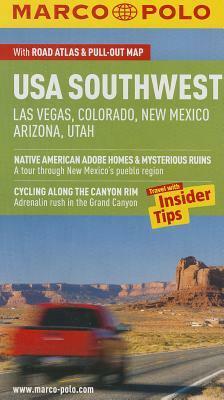 Marco Polo USA Southwest is another guide I had chance to read and enjoy, coming from the esteemed UK publisher. Using this guide I am sure tourist will be able to experience many interesting and adventurous things these southwest US states offer. If you are familiar with layout of Marco Polo guides no big surprises here - places to sleep and eat while visiting American Southwest, list of trips and tours, best places for shopping and those that must be visited with kids, places to spend the night Marco Polo USA Southwest is another guide I had chance to read and enjoy, coming from the esteemed UK publisher. Using this guide I am sure tourist will be able to experience many interesting and adventurous things these southwest US states offer.